Below are the steps to properly unbox and setup your printer. 1. 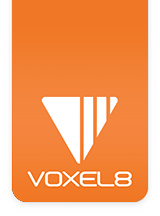 Find a suitable area to setup your Voxel8 Developer's Kit Printer (see Picture 001). The area selected should ideally be a solidly constructed bench or table that does not shift, move, or vibrate. It should be able to handle the weight of the printer which is about 40 lbs (i.e. roughly 18 Kg). The area should also have a suitable WiFi network that the printer can connect to, or an Ethernet hookup close by that connects to the internet. IMPORTANT NOTES: The setup area you select should also ideally not be in direct sunlight as this may affect the performance and accuracy of the laser profilometer on the machine. It should also not be next to an area that shifts widely in temperature as it may effect the quality and reliability of your 3D prints. Other exotic atmospheric conditions revolving around pressure can also have an adverse effects on your print quality and reliability (e.g. a printer at high altitudes). Picture 001: Printer Work area Setup (i.e. rigid construction, plenty of space for and around the printer, not close to a back wall). 2. Open your Voxel8 Developer's Kit package from the top area which has the "Made in USA" logo and "Developer's Kit" text (see Picture 002). Carefully use a pair of scissors or a utility knife to slice the tape holding it closed to open it. Picture 002: The Voxel8 Developer's Kit box has been opened from the top. 3. Once the box is opened, two people should carefully pull the printer from the box in an upwards motion using the provided handles that flip up (see Picture 003). NOTE: The Printer is rigid body construction so it weighs approximately 40 lbs. It's best to take it out of the box with two people to prevent injury. Picture 003: The Voxel8 Developer's Kit Printer is being lifted out of its external box shell. 4. Carefully keep pulling up using the two handles provided on the box insert (see Picture 004). Picture 004: The Voxel8 Developer's Kit Printer is being lifted out further from its external container box. 5. At a point, the external container box will slowly drop to the floor, which is to be expected (see Picture 005). This can be moved to the side while completing the unboxing procedure. Picture 005: The interior box container is lifted out of the external container box. 6. Now you will be holding the internal box container housing the printer, as well as storage compartments for all your Voxel8 Developer's Kit consumables, tools, and replacement parts (see Picture 006). Picture 006: The Voxel8 Developer's Kit Printer has been removed from its box container. 7. Place the internal box on the floor next to the sturdy workbench (see Picture 007), or table you will ultimately place the Printer onto for operation. Picture 007: The Voxel8 Developer's Kit Printer has been removed from its box. 8. Next, grasp and remove the top piece of foam with the logo (see Picture 008) to reveal your Voxel8 Developer's Kit Printer contained inside (see Picture 009). Picture 008: The top piece of protective foam is being lifted out. Picture 009: The top piece of protective foam is being lifted out. 9. Examine the top compartments to reveal the provided 0.75kg spools of 1.75mm thermoplastic PLA filament inside. There are four bays containing the filament, at least two on each side of the top (see Picture 010). Picture 010: A side compartment has been opened on the side of the printer shell. 10. Remove each filament spool from their respective container bays (see Picture 011) and store in more convenient area next to where you will operate your Voxel8 Developer's Kit 3D Printer. NOTE: We recommend keeping the shrink wrap around spools you will not immediately use as it increase the longevity of the thermoplastic when not exposed to the elements. Picture 011: A spool of 0.75kg thermoplastic PLA filament is removed from its compartment. 11. Now locate the smaller compartment bays in between the areas that contained the spools of PLA plastic (see Picture 012). These will contain conductive silver ink, solvent, tools, as well as replacement parts you will use later. Picture 012: The smaller compartment for accessories has been located. 12. Open the top tab of the smaller component and remove all the accessories contained inside (see Picture 013). Place these items near the area where your printer will ultimately operate. Picture 013: The smaller compartment for accessories has been opened. 13. Locate the orange build plate(s) * inside the foam inserts at the top of box (see Picture 014) and remove them for installation at a later stage. Note: * For "Get it First" orders, you will receive two build plates. All others will have one single build plate in their Developer's Kit Box. Picture 014: An orange Voxel8 Build plate. 14. Now that all the materials and accessories have been removed, it is time to reveal the Voxel8 Developer's Kit Printer. While the interior box is on the floor, remove the buckles by depressing on the strap buckles until they release (see Picture 015). There are two of them holding the foam encasing around the printer. Picture 015: Releasing the interior case buckles. 15. Once the clips have been undone, it is time to carefully pick up the Printer and move it to a sturdy workbench or elevated table where you plan to run the machine (see Picture 016). We recommend picking it up with two people as the machine weighs at least 40 lbs (roughly 22 Kg). Picture 016: The Voxel8 Developer's Kit 3D Printer has been revealed. NOTE: Keep the shipping box that your Voxel8 Developer’s Kit arrived in in a safe place. You may potentially need this box in the future for transport, packing, or storage of materials. 16. Remove any protective coverings attached to the machine on the exterior frame. Also remove any pieces of tape that are holding things in place such as the front clear acrylic door and side panels. 17. Once the printer has been unboxed, you should run through the box contents to familiarize yourself with the Developer's Kit tools, consumable materials, accessories and replacement parts.